Stella and Chewy's is dedicated to the simple idea that dogs and cats should be healthy and happy every day of their lives. The freeze dried meals are packed uncooked and made from pure, simple and minimally processed ingredients to provide your pet with food as nature intended! All meals are prepared in house by Stella and Chewy'sSecureByNature food safety process to protect naturally against harmful bacteria while maintaining food integrity and taste. Available in great flavors for your dog like beef, chicken, lamb, duck and fish and great flavors for your cat like salmon and chicken, each meal is made from raw, naturally raised meat, chicken and fish from reputable USDA-inspected sources and organic vegetables. There are no added fillers or grains and there is no cooking process to leech away nutrients, only natural taste and necessary vitamins and minerals. The raw diet improves appetite and digestion, stamina and vitality, improves the immune system and helps your pet maintain and healthier coat and skin. 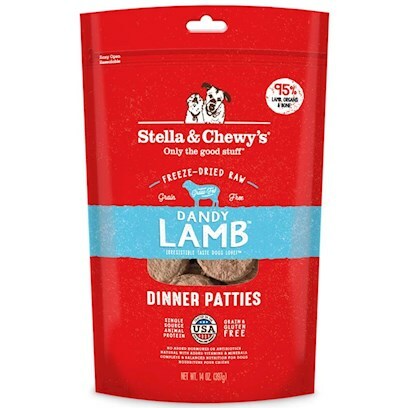 Help keep your pet healthy and happy with Stella and Chewy's Freeze Dried meals. Formulated to meet the nutritional levels established by the AAFCO Dog Food Nutrient Profiles for All Life Stages. Lamb, Lamb Spleen, Lamb Liver, Lamb Bone, Lamb Heart, Lamb Kidney, Calcium Carbonate, Pumpkin Seed, Potassium Chloride, Organic Cranberries, Organic Spinach, Organic Broccoli, Organic Beets, Sodium Phosphate Monobasic, Organic Carrots, Organic Squash, Organic Apples, Organic Blueberries, Choline Chloride, Dried Pediococcus Acidilactici Fermentation Product, Dried Lactobacillus Acidophilus Fermentation Product, Dried Bifidobacterium Longum Fermentation Product, Dried Enterococcus Faecium Fermentation Product, Taurine, Tocopherols (Preservative), Zinc Proteinate, Zinc Sulfate, Iron Sulfate, Iron Proteinate, Vitamin E Supplement, Niacin, Copper Sulfate, Copper Proteinate, Manganese Sulfate, Sodium Selenite, Manganese Proteinate, Thiamine Monohydrate, Pyridoxine Hydrochloride, Vitamin D3 Supplement, Calcium Iodate, Vitamin B12 Supplement. Serve as is or rehydrate by adding warm water. Your pet should consume 1/4 cup of water per patty daily. New Users: Mix Stella & Chewy's with your current brand for the first 5-7 days.